A special committee made up of people of all ages was responsible for the preparations, and stake holders from various walks of life and different institutions were invited to join with our families, young people and friends of ATD Fourth World in celebrating the occasion. Guests included local government leaders, municipal workers, teachers, health insurance providers and representatives from the Registration, Insolvency and Trusteeship Agency (RITA). In all, more then 70 people attended the event. Our main aim was to provide an opportunity for our families and stake holders to learn from each other and join together in the work to eradicate extreme poverty. We wanted stake holders to have the opportunity to hear from people living in extreme poverty about their courageous day-today struggles and resistance to extreme poverty. We wanted our families to have the opportunity to listen to new ideas from the different stake holders that might help them to move forward. Our hope was that mutual understanding would lead to future collaboration in our struggle to eradicate extreme poverty. The World Day for Overcoming Poverty is an opportunity for those who live in extreme poverty to talk about poverty with their friends and to raise their voices together so that they may be heard throughout the world. 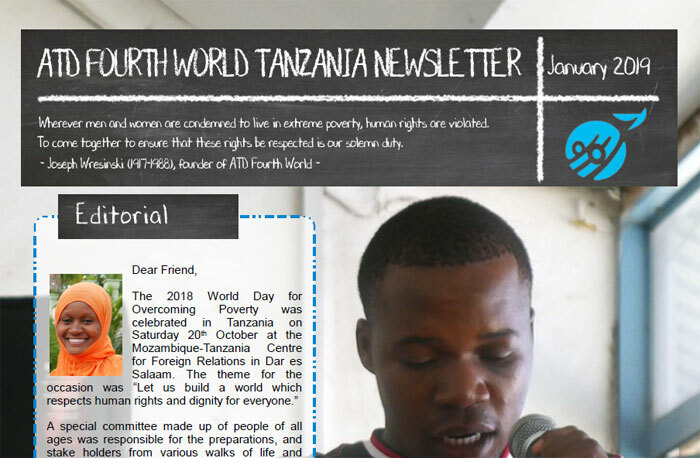 In Tanzania we invited people to prepare testimonies to describe their lives, their struggles and their acts of solidarity in the work against poverty. In the following pages you will be able to read three of the testimonies shared with us on that day.